Andy Manson came to America as a child from Scotland. He volunteered for the U.S. Army Air Corps in World War II and flew as a B-24 navigator. After the war, he spent the next 48 years in air freight. With the help of the GI Bill, he worked his way through college. He was the first in his family to graduate from college. He flew as a navigator at Seaboard and then worked as a crew scheduler. He continued in that capacity at both Flying Tigers and FedEx. Andy and Elsie raised three children. He retired in 1994. Elsie died in 2004 after 57 years of marriage. After suffering a crippling head injury, Andy died peacefully early on Monday, November 7, 2005 at the age of 83. He is survived by his daughter, Karen; sons, Robert and Donald; and six grandchildren. 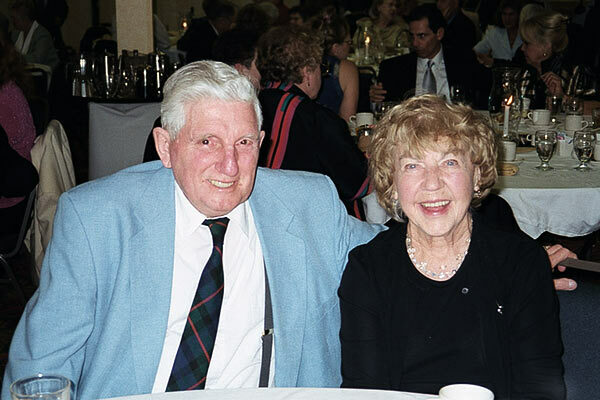 Andy and his wife, Elsie, are seen here at the 2000 SPAR reunion in Cocoa Beach, Fla.